I have a love/hate relationship with foamboard. What I love about foamboard is price; compared to GatorBoard or Sintra, it’s the lowest-cost option around. On the other hand, it’s also the most fragile option out there. Our customers typically use foamboard to mount enlarged photos, display signage or a variety of other large-format applications. You’ve probably used foamboard for your child’s school project at one time or another. It’s versatile, rigid and easy on the wallet. But lets get back to what I hate about foamboard. It’s not the overall sturdiness of the product that I dislike; it’s how easily you can destroy a mounted print by simply bumping the corner of your board against a wall. It doesn’t take much – just a simple nudge, and you’ve now turned a nice looking display into something that looks like my kids got ahold of it. And here’s the kicker – most of the prints that are mounted to foamboard aren’t cheap! You can easily spend $100+ on an enlarged photo only to destroy it by a simple misstep. 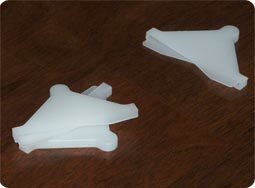 Fortunately, the solution to this problem is simple – plastic corner protectors. Whether you’re a print shop selling foamboard or a customer transporting a grade-making school project, corner protectors can save your investment. And, they’re cheap – only $30 for a box of 250. It’s a small investment to save you time and money in the long run. Want a free box of corner protectors for yourself? Tell us a story of a notable foamboard experience – we’d love to hear it!